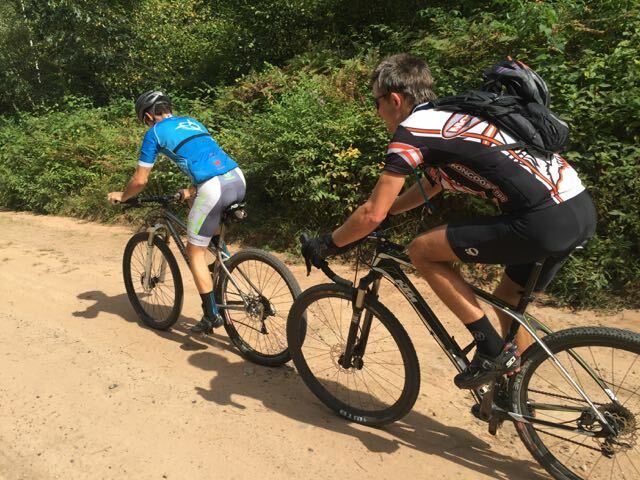 This entry was posted in Comments about Cycling on September 17, 2015 by Steve Tilford. I got up to Cable late on Tuesday night. Dennis naturally wondered over to the Kansas garage and we stayed up another hour, so it was a late night. We woke up and Karl’s, Stacie’s husband, pickup truck was parked out front. 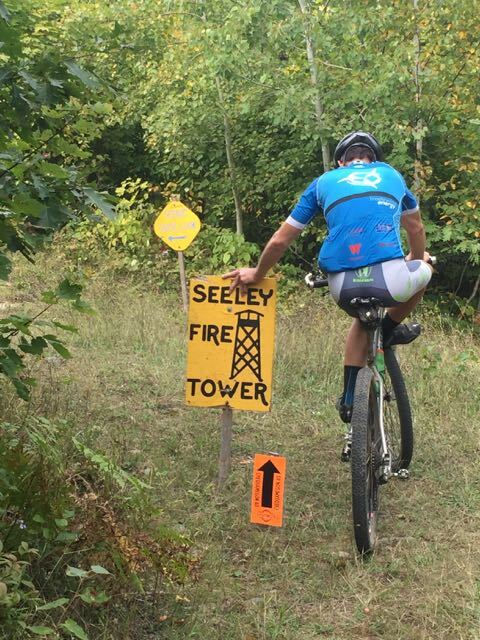 We ate and then headed down to Hayward to ride the full Chequamegon course. We started in FIsh Hatchery, the first off-road section after the road start. They are putting in a new subdivision there, so we have to cross a road about 100 meters after entering the grass. This might switch up the chaotic start a little more. Then we just rode the course. I felt so flat that I was really dragging, even on the downhills. Bill seemed to be pulling away from me everywhere. I sort of wasted my lungs at the Dirt Fondo in Durango, starting much harder than I’d anticipated. The day after the ride I was coughing up little nodules. And they were still present somewhat. Anyway, Karl was going pretty good, but it kept getting hotter and more humid. Karl eventually took his helmet off and felt amazingly better. We kept riding at a steady pace and I started feeling a little better. Karl decided to head back to Dennis’ after 35 miles. We rode steady hard up the high point and all the way to the finish. At Telemark, Gary and his crew were out setting up tents and doing all the manual work that needs to be done before an event like this. Bill and I helped with one 20 x 20 tent. I can’t imagine how hard it was to sent up the huge “circus tent”. The course is super fast. And it just got faster since it rained all last night and is still raining. The course was loose, if anything and water just makes it that much faster. I had a crazy headache last night after dinner. 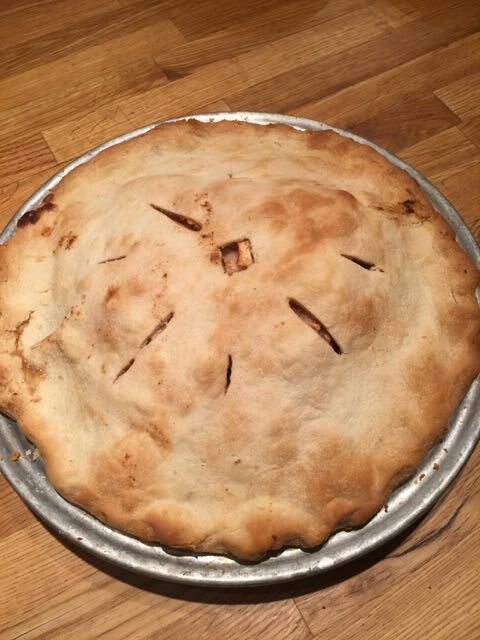 We stopped at a friend’s house and picked some apples, so I made an apple pie for dessert. Bill was trying to find Cross Vegas on the internet and I just went over to go to bed. But, sleeping wasn’t working, so I got my iPhone out and found the race on Universal Sports. I watched the end of the women’s race and then fell to sleep. I woke up an hour later and still had a crazy headache, so I turned back on the race. The race looked great. Like I wrote a couple days ago, I sort of wished I would have went from Durango to Las Vegas, for Interbike, then flew directly to Minneapolis on Thursday and met up with Catherine to get a ride here. But I decided to drive 2500 miles, which is most the way across the United States if I was going in a straight line. I’m a little worried it hurt me more than I had anticipated. But, maybe not because I felt better at the end of the ride. 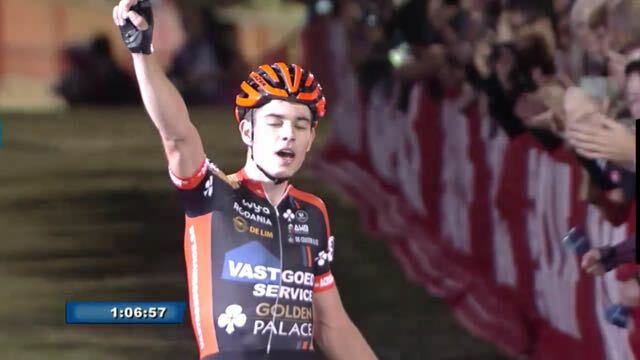 Anyway, Cross Vegas was good. 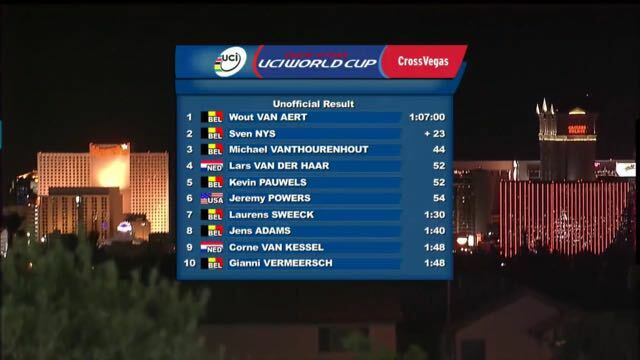 Jeremy Powers had a super race, finishing 6th, which is the best finish ever by a US man in a World Cup, I think. It is unbelievable how fast those guys are going. Riding through sand and then sprinting back up to speed isn’t something I was ever very good at. Belgians were 1st, 2nd and 3rd. Ryan Trebon was 12th, which was stellar too. Brian Matter, who has won here at Chequamegon more than anyone else, raced Vegas too. He was 38th, which was okay, but probably not what he was hoping for. I’m sure he’ll be the guy to beat here on Saturday. Anyway, I slept until 9:30 today and am a little fuzzy this morning. I’m not too hurt from 3 hours yesterday off-road. I think the whole issue is driving so much. But I have a couple days still to recover, so I’m hoping it will be fine. I have some bike work to do today. Good time since it is raining. I have to seal up Catherine’s and Dennis’ tires tubeless. 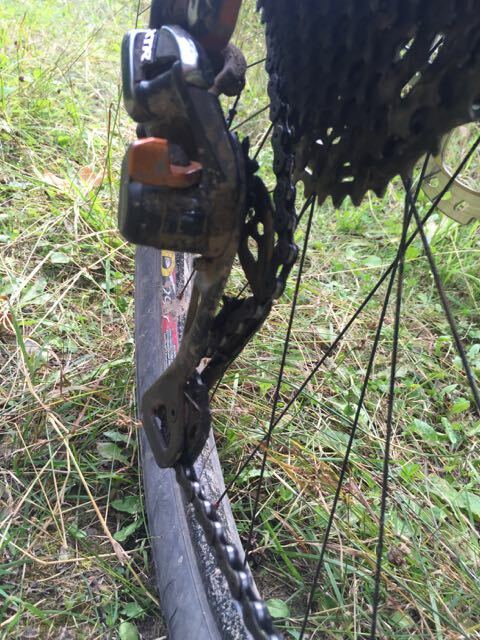 I got a stick in my rear derailleur right after the high point and it jacked up my cage. The cages on the new Dura-Ace and XTR derailleurs seem pretty light to me. Carbon fiber for the outside cage and aluminum for the inside. The stick got wedged in and bent the inside cage. I thought I was going to have to put on a new derailleur, but I took it apart, straightened it, and it seems good now. I’m trying to decide whether to put on a rigid fork. It is 2 pounds lighter than a shock fork and I left my fork lockout out virtually the whole way yesterday. Okay, that is about it from here today. I’m going to try to stay off my legs all day, but that never works out. Catherine is showing up tonight, along with Evelyn Dong. Tomorrow more people are showing up. Katie, plus Matt and Tim. It should be a fun weekend. Bill and Karl on Janet road. Waiting at the top of the high point. 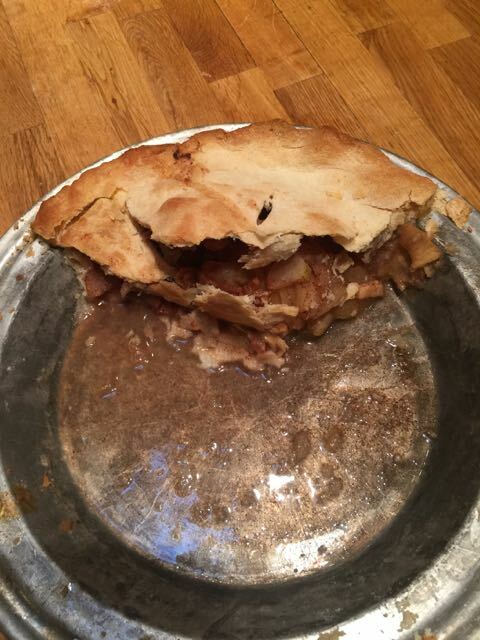 Pie this morning. Now it is gone. My rear derailleur after the stick. 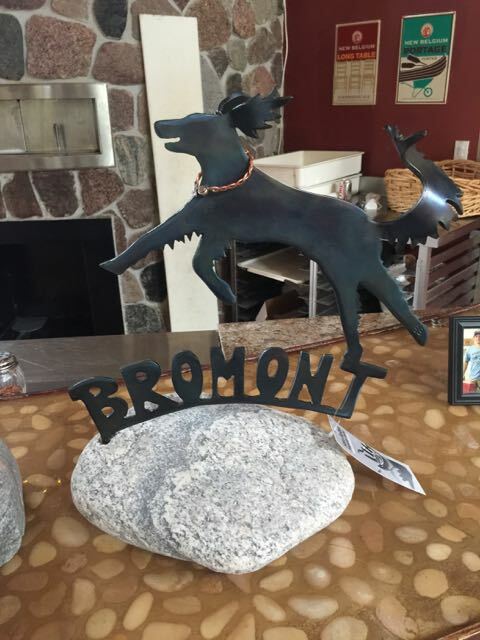 Sara Balbin, Gary Crandall’s wife, made this in remembrance of Bromont. It is so nice. Sara made one for Annie, Mick and Beth’s puppy. This is at the Rivers Eatery in Cable. Stop by, if you’re at the race and check them out. That Bromont fan art is lovely. 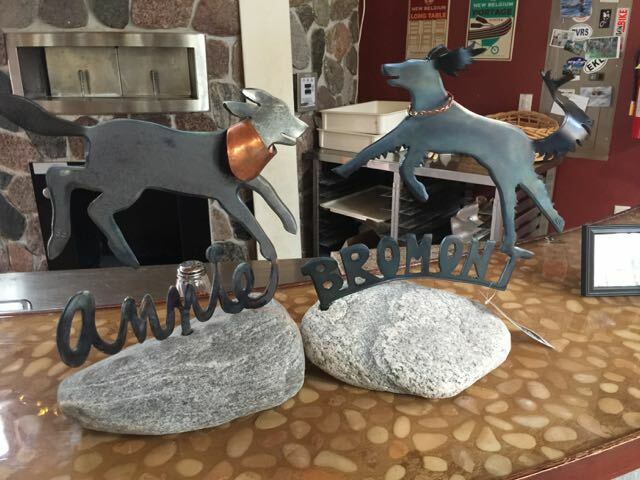 Love the Bromont art. Did I miss you getting a new canine companion?